Sentient Developments: Economist: Safe without the bomb? 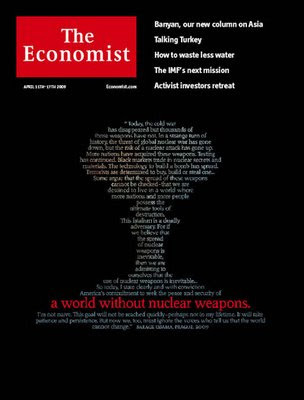 Economist: Safe without the bomb? Nuclear weapons cannot simply be wished away or uninvented. The technology is over 60 years old and the materials and skills needed are widely spread. Still, by infusing his idealism with a dose of realism Mr Obama can do more to create a safer world than simple “Ban the bomb” slogans ever could. For zero nukes would make no sense if this left the world safe for the sorts of mass conventional warfare that consumed the first half of the 20th century. How many bombs would be needed to prevent that? And with what co-operation and controls to keep these remaining weapons from use? It is hard to say what sort of nuclear future would be more stable and peaceful until you get a lot closer to zero. Happily, the difficult steps needed to get safely to low numbers would all be needed for zero too. Mr Obama’s vision is helpful if it gets people thinking about imaginative ways forward. Mr Obama is already committed to using the goal of zero to shape his future nuclear plans. Both America and Russia still have far more nuclear warheads than either wants. Even George Bush, no dewy-eyed disarmer, negotiated cuts down to 1,700-2,200 apiece by 2012 (from the 6,000 agreed upon after the cold war had ended) and was ready to go lower. Encouragingly, Mr Obama and his Russian counterpart, Dmitry Medvedev, have agreed that a modest cut will accompany new weapons-counting rules to be fixed by the end of the year, with more ambitious reductions to follow. All the official five except China have been trimming their arsenals too. Hmm, now where have I heard this before? Oh, yeah -- right here on this blog. Obama isn't (honestly) arguing for zero nuclear weapons. He's arguing for zero non-American nuclear weapons. Were the latter true, he'd have ordered the disposal of his own before bringing the subject up. this is how the arms race is manifested today. The Russian development of the MIRV is a response to US plans to develop a defence shield. Balance is restored by the world becoming even more dangerous. So in my opinion it is not the stockpiles that are dangerous, but this new arms race of "we are going to shield ourselves" -"oh yeah, well we are going to make MAD even easier".